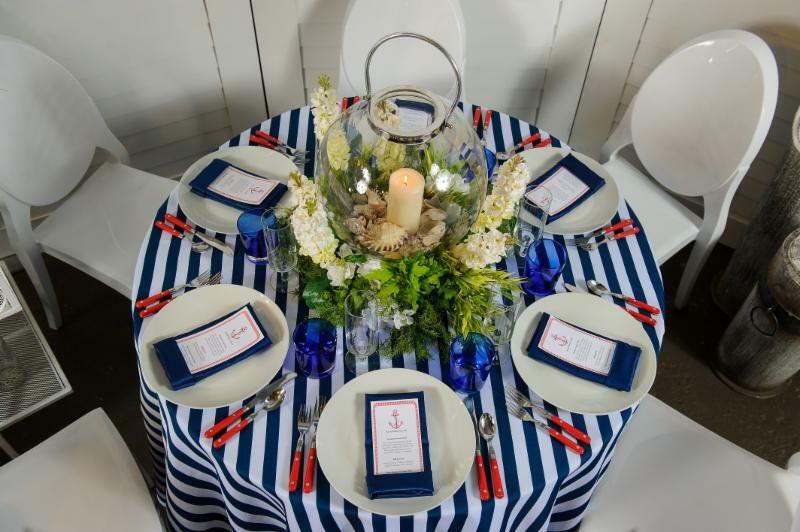 Meetinghouse & True Cuisine's Guest Designer Table, "Lakeside Luncheon" is a tribute to the summer that we hope lies ahead. We are in Chicago, after all! But there won't be many lazy days of summer for the SBR Events Group (the newly formed company comprised of Meetinghouse, Sweet Baby Ray's Catering and True Cuisine). Together these three companies form SBR Events Group, the new powerhouse in our industry whose full service reach covers catering, hospitality, event production and design. 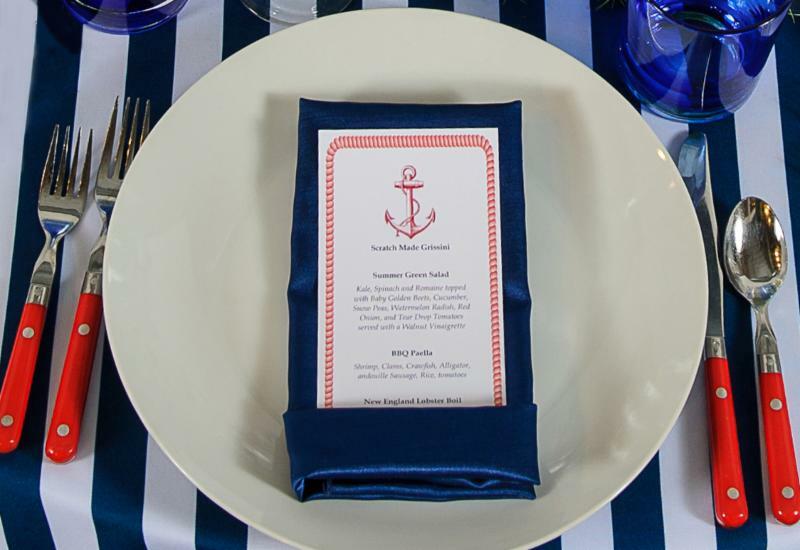 David Halsey of Meetinghouse created the design and Mallory Weathers of True Cuisine designed the menu. When they started brainstorming on a gloomy grey spring day, they thought of summer. They decided that linen would complement their nautical look. 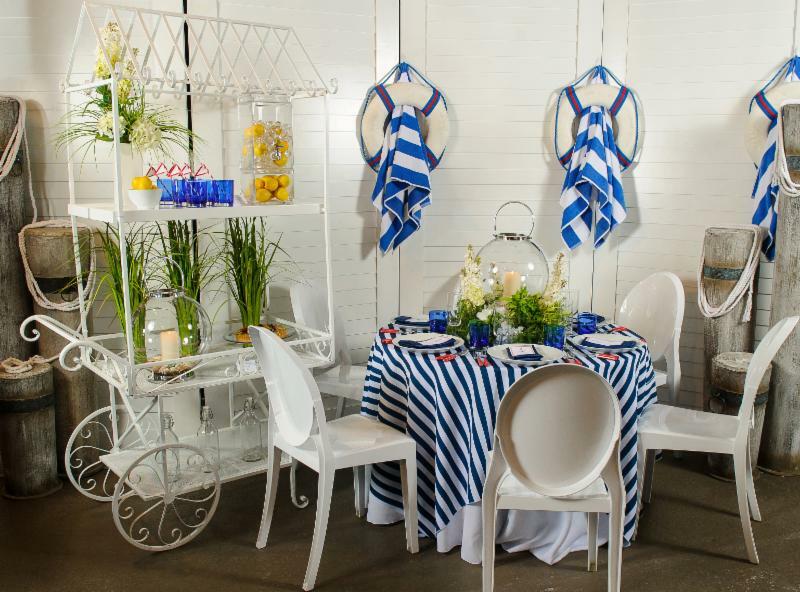 Our Navy and White Stripe cloth fit in perfectly. According to David, navy is a color that never goes out of style, looks refreshing, crisp and serene. The centerpiece he created, shown here in all its glory, complements the fresh summer feel of the table. The whole design and food team showcased their creativity by not only coming up with an appealing vignette but impressed us by using the set-up time to take a round of new food photos for themselves. We had their chefs here creating their entire menu. Look how different (and yummy) their food looked. 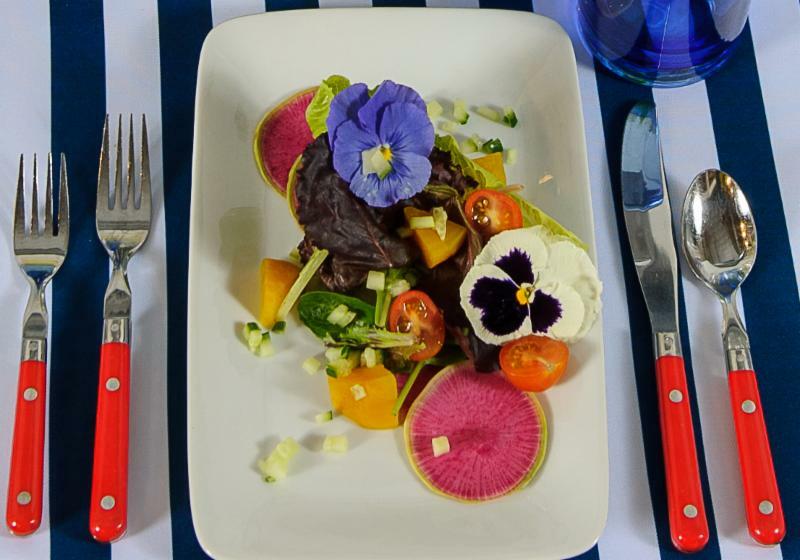 The table had a spacious feel and they had room to turn our White Round-edged Rectangular Plate vertically to make a bold statement and really make their salad pop. 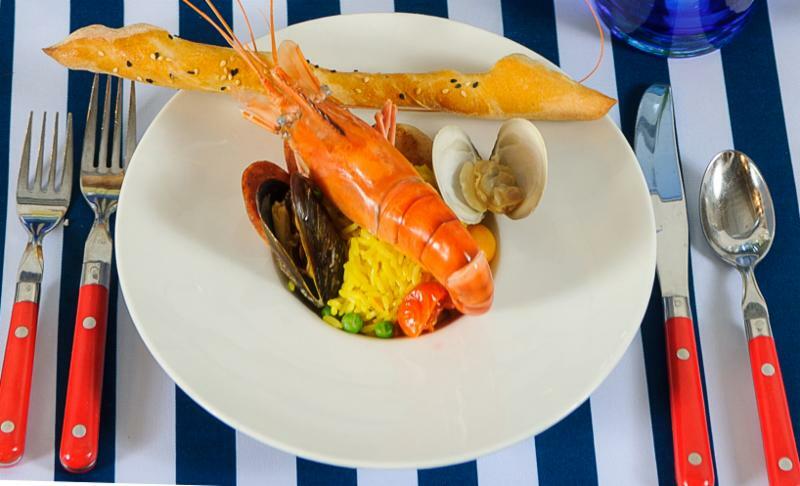 The Navy and White Striped cloth is a lovely juxtaposition to the horizontal positioning of each breadstick. 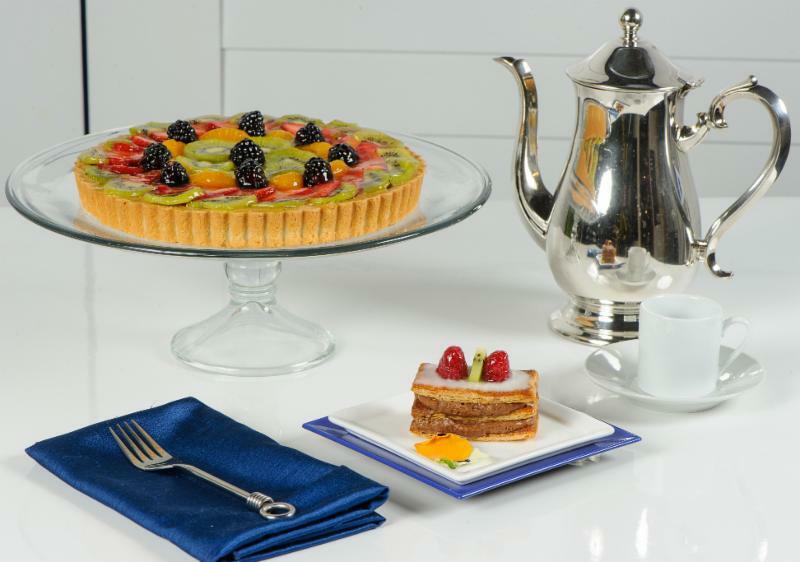 The designers created an interesting contrast to the linear pattern of the linen by layering the dessert plates, our White Square Sheer Thin-Rimmed Plate on top of our Royal Blue Square High Gloss Plate and then turning them both to create a diamond point. 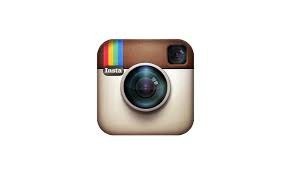 Another example of simplicity is achieved through the use of geometric boldness. They didn't miss a beat with all the details in their vignette. Meetinghouse has always had an extensive use of props, but the company evolved into full service design company. In addition to their pilings and life preservers, they used our flower cart. If you look very closely you will discover real food accents like the gorgeous tart as well. 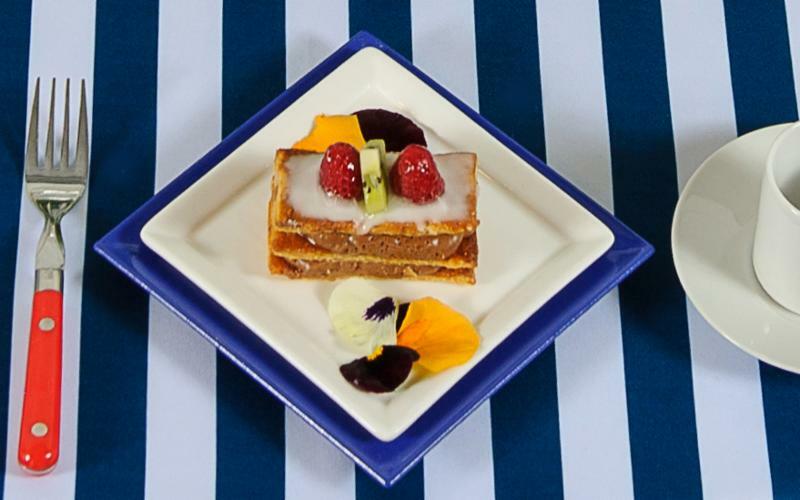 But then, for their own photo collection, the tart took center stage when they created one of the many food shots they took that day. 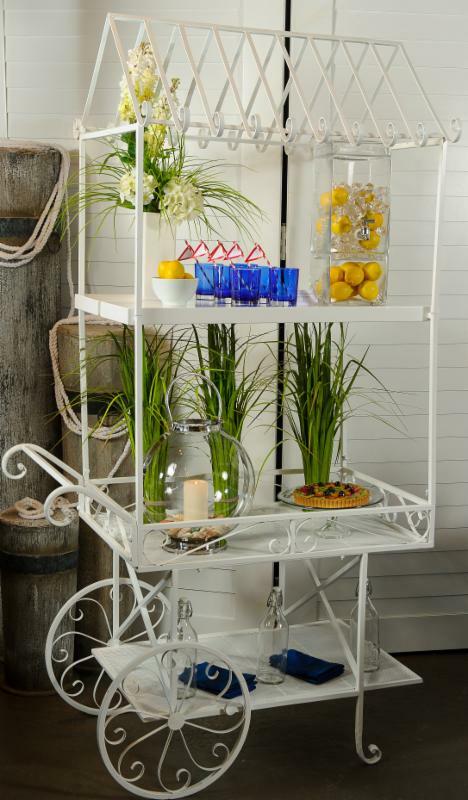 More items on the cart include our Contemporary Glass Beverage Urn filled simply with lemons. 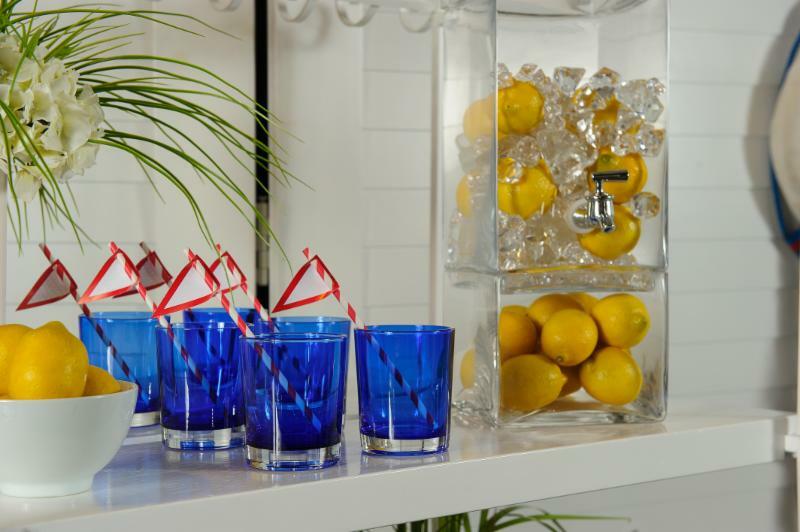 Our Sapphire Blue Tumbler and our Red Striped Straws with Optional Flags really pop when flanked by lemons both in the urn and in a simple White Porcelain Bowl. Over lunch and wonderful conversation, we saw the best of this new company-new relationships and brainstorming between the Meetinghouse team talking about the design element and the folks from True Cuisine always focused on the food perspective. But equally important, we saw how they truly understand the importance of relationships as they included their long-time favorite photographer, Michael Paul, in their wide-ranging discussion on all aspects of the creative process in our industry.